Psychic Techniques | QuantumPhoenix.net – Esoterica, Paganism & Ritual Magic. We invite you to take a journey in to the world of practical application of tarot for self and others, in a natural woodland setting to expand your deeper connections to messages from this popular divination tool, that traces back to it’s medieval roots! Intended for anyone with some or no experience of reading tarot, for self or others confidently. Fixed Fee: £35 (must book in advance). .
Use this secure paypal link below to pay £35. This is an experiential workshop, taught by Vathani Navasothy (Tarot Reader/ medium & Reiki Practitioner) & co-hosted by Mani Navasothy (Astrologer, Wiccan High Priest & Ritual Magician). Welcome to our Wicca New moon : Training & Healing Circles. These will run between September- December 2018. New comers , Seekers & Beginners to Wicca welcome. We meet in the pub, then walk together to Queen’s Woods for actual ritual. -Consecrations, Magic Circle & Calling elemental quarters. Witches Rune/spiral dance, God/Goddess invocations. -General magic / Empowerment spells/ Healing & protection work. These are Practical Wicca & magic training circles. Regulars will be firmly encouraged to take on roles and practise circle-craft. (Then experienced people can take roles in our other bigger seasonal rituals). Healing /protection work limited to 2 people each time. Contact me in advance to make the request with details for planning the magic carefully. Work will be done only for the person actually attending the ritual. We use Healing chant and Rune-chants. Please observe confidentiality & privacy at all times. This is NOT a coven.. but an open/ practise circle. Those interested in serious wicca training & initiations, should attend our autumn courses & workshops and follow it up with serious commitment. Make an appointment and talk to Mani in person. we shall start to be more careful of what we place on altar! Each ritual is prepared and has certain themes/ expectations. Some God/Goddess items are not always suitable in every ritual. These circles are facilitated by Mani – an initiated Wiccan High Priest, with over 22 years of Craft & Cove experiences in London, UK. Mani has published several books on Wicca, runs training courses, provides an e-Witch Apprentice course online, and writes extensive blogs on Astrology & magical topics. Meet at 7pm in the heated patio area of the Pub. We leave at 7.30pm to go to woods. This has been used by witches, covens, shamans, eco-groups & ritual magicians for many decades. Please do not come late to woods and enter circle once it’s cast – it breaches magic protection inside, causes headaches for circle-caster and leaks built up energy, allows negative entities to enter our protected space!! In the same way, please do not just `leave’ the circle in the middle of a ritual in progress. On both occasions, please wait on the edge for a suitable moment for the Circle-caster to create a `door’ and let you in/ out and close that `magic gateway’ immediately. !!! -Please bring sensible food & drinks to share. (bred/ cheese/ wine/soft drinks). -Please be prepared for different types of Weather. In the woods, it can get wet/cold quickly.. check weather reports.. and come dressed appropriately. -A small plastic sheet to sit on.. Ground can be wet or damp. -Torch light .. essential for walking about the woods in the dark. Circle will close after a few rounds of passing blessed Cakes & drink from the Altar. Then we will be seated for magical chats.. Share your experiences of what the ceremony has brought and clarify magical points, symbolisms and any questions that may have risen. It is important to remain in a tranquil state after ceremony..to allow magic energies to sink in and transform us. This is the night of a TOTAL LUNAR ECLIPSE in the sign of Aquarius – realm of the mystical water bearer. Let us come together at the heart of London for our monthly `Tamesa London Circle’ (established in 2006), to honor the Triple Goddess of the Moon and do Dragon Magic for our own primal Serpent power of transformation, Healing and Empowerment! No prior knowledge or experiences of wicca or ritual magic is necessary for you to attend this. Just come with an open mind. Be friendly and non-intrusive. Connect with others, and join in the ceremony. Facilitator: Mani Navasothy – Wiccan High Priest, AstroMage, Ritual Magician and author of `Eclipse Magic Workbook’ (published 2012). Gather outside the Green area of Tate Modern Gallery (main doors) by 7.30pm. We’ll walk down to the banks of Thames and do this ceremony. No entry into our ritual circle after circle is cast – for magical safety. So please attend on time to participate. Thank you. Our rituals tale place on the actual river bank…just few meters away from the water, but in a secluded spot..where there is usually some sand. We organise these Thames-rituals after checking Port of London authority Thames Tide time tables.. to take place at low tide.. (At high tide the entire river bank is under many meters of water!!). After the ritual circle on the river bank is completed, some people leave for home. Others stay behind to socialise. We tend to go back up to street level, to the grassy green area outside Tate Modern Gallery and socialise/ share food & drinks.. If it’s raining, we just go to the nearby Pub within sight. Hi all.. way too much hype and partial info (pardon the pun) going on..So here’s the Honest-to-stars full astronomical data (from NASA’s Eclipse expert Fred Espenak) . Diagram taken from his page. At 21:13 moon begins to come out of the dark shadow. By (U4) 22:19 hrs it will have just finished coming out of the dark shadow…but still inside the red penumbral shadow (moon visible). This Penumbral part ends by (p4) at 23:28hrs GMT. Friday 13th July 2018 is a day of New Moon and partial Solar Eclipse in the psychic & intuitive water sign of Cancer! And we are gearing up for a special ritual – to aid the removal of blockages, reclaiming your primal magical currents within, and raising your Witch-powers! This new moon/ solar eclipse time is just perfect for beginning this work! We’ll set up a wicca circle, and proceed with a meditative & transpersonal work for stage 1, then work ceremonially for clearing blockages, and finally do ritual magical work for your own energy raising and creation of a witch-charm. These circles are facilitated by Mani – an initiated Wiccan High Priest, with over 21 years of Craft & Cove experiences in London, UK. 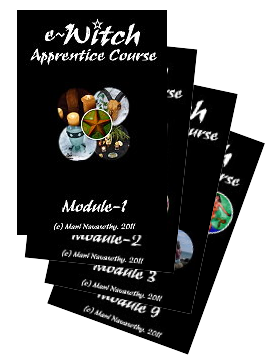 Mani has published several books on Wicca, runs training courses, provides an e-Witch Apprentice course online, and writes extensive blogs on magical topics. venue: Queen’s Woods, High Gate, North London (meeting point is the garden area of The Woodmans Pub, Archway Road. Nearest tube: High Gate). -Leaving woodland site – 10.30pm latest. Please meet in the heated patio area of The Woodman’s Pub, Archway Road by 7.00pm. We *really* like to run these weekday rituals on time. Please do not come late to woods and enter circle once it’s cast – because it breaches magic protection inside, causes headaches for circle-caster and leaks built up energy, allows negative entities to enter our protected space!! In the same way, please do not just `leave’ the circle in the middle of a ritual in progress. On both occasions, please wait on the edge for a suitable moment for the Circle-caster to create a `door’ and let you in/ out and close that `magic gateway’ immediately. !!! Please be totally prepared for different types of Weather – as it can change within an afternoon. Also once in the woods and standing in one ritual spot, it can get cold quickly.. So please check weather reports.. and come dressed appropriately. –Torch light .. essential for walking about the woods in the dark. Circle will close after a few rounds of passing blessed Cakes & drink from the Altar. Then we may have time to be seated and have some communal magical chats.. (avoid mundane chats immediately after ritual please.. Allow magic to sink in.. Don’t become chaotic or noisy after ritual. Avoid worldly gossips, politics, promotions for other events.. Keep all thoughts positive and be in the moment.. If anything, share your experiences of what the ceremony has brought and clarify magical points, symbolisms and any questions that may have risen. It is important to remain in a tranquil, magical-mode after ceremony..to allow magic energies to sink in and transform us. Once formal ritual & magical work is complete, Organiser will need 20mins to recharge and pack up Altar items before leaving around 10.30pm. If anyone wishes to leave immediately after ritual, alone or in groups, you are responsible for your own way back to the road. Near the time please check `comments’ section of this event.. for any additional info/ preparations. Stellar Engineer Your Life with Eclipse Magic! This is a special workshop (first time!) , scheduled to tap into the stellar and highly transformative energies of the set of 3 Eclipses coming up (Partial Solar Eclipse/ 13th July; Full moon Eclipse/27th July; Partial Solar eclipse 11th August). Eclipses usually occur in pairs (A solar & a Lunar one) but this is a rare occasion indeed where there is a set of 3. So it provides a unique opportunity. 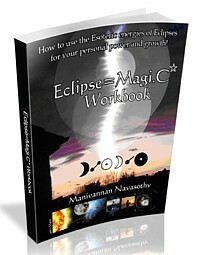 I wrote and published a book `Eclipse Magic workbook’ in 2012 – first book of it’s kind (go on do a search on google for anything like that before 2012!). Since then as with the 100th monkey effect, eclipse magic has started to filter into astrological forecasts of other people. I’ve even found people illegally selling some of my eBooks on internet (sad fact of our times!). So for the first time I am setting up a course of 3-4 hours to talk through and teach basics of Eclipse Magic as I have practised it for almost 2 decades. (I set up these courses twice before, and cancelled it. But have run 2 ritual events on eclipse nights or just before..to give short guidance). This one however will be extensive. No previous experience of Eclipse magical working necessary. Eclipse Magic rituals are quite unique and separate ..and use practical tools (some modern ones such as a plasma-wand), astrological symbols/ names, some transpersonal work and magical visualisations. Note: This course will be cancelled in the event of low numbers of booking and any payments returned in such an event. The stellar forces of Eclipses are comparable to chaotic stormy seas – and knowing when Eclipses take place and what types of personal magic you can do, enables you to tap into those powers to accelerate, course-correct, enhance and empower your life! Every Year there are at least 2 pairs of Eclipses (Solar & Lunar) – which means you can do Eclipse Magical works 4 or more times in a year! Some works can be done with only 5 minutes of effort, and others take a few weeks or even a few months of preparation. But all create intense changes over longer periods of time in your life. This innovative, easy to use e-book gives full introductions to the Science, Astronomy, Astrology, Esoterica & Magical core concepts useful to all who like to experiment with Eclipse Magical Techniques. Mani Navasothy has been personally exploring these for over 15 years, and is now sharing his own secret techniques of using Stellar energies for Balancing, Cleansing, Powering Up, as well as the highly specialist methods of using Dragon Magic & Portals and Cosmic Gateways. You can watch a previous video filmed by Mani, explaining some general work/ principles of Eclipse Magic. You may explore backgrounds to Eclipse Magic by visiting Mani’s free website dedicated to this subject matter…where charts, free webinars, videos and intro e-books are all available..
You can purchase the full `Eclipse Magic Workbook’ (https://quantumphoenix.net/books-published/eclipse-magic-workbook/) here.